I have been in a turkey rut the last couple of Thanksgivings. I have done the deep fried turkey, smoked turkey, covered in bacon turkey and of course, traditional butter turkey. This year I have been scouring the internet for a new way to prepare the ceremonial bird. After reading countless articles and turkey recipes, I came across one calling for a mayonnaise rubbed turkey. I have heard of mayonnaise being used to help brown bread (The Grilled Cheese Truck uses a combination of butter and mayonnaise to perfectly brown their bread). So why wouldn't it work for turkey? Well the short answer is that, yes it does. It has the same magical browning power for bread as it does for turkey skin while also keeping the bird moist and flavorful. The results were fabulous - better than expected to be perfectly honest. Aside from the fact that the turkey was delicious, it was super easy to prepare. I didn't have to do much in the way of flipping, basting, turning or other labor intensive meddling while the turkey roasted. 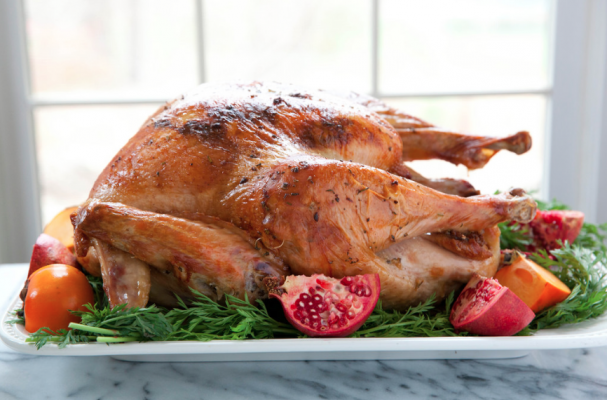 So if you are looking for a delicious yet stress free turkey, this recipe is it. Step 1: Remove the turkey from the fridge and bring to room temperature. The turkey should be mostly thawed at this point. Remove the giblets and neck and set aside for gravy. Use a paper towel to remove excess moisture from the skin. Step 3: In a food processor, add the mayonnaise, thyme, rosemary, and sage. Process until ingredients appear combined, about 30 seconds to a minute. Add the roasted garlic cloves and process again. Step 4: Generously rub the turkey with the garlic herb butter, making sure to get both underneath the skin and the outside of the bird. Season with coarse sea salt and black pepper. Fill the cavity with the other head of roasted garlic and any leftover ingredients you may have from your thanksgiving prep including celery, onions, lemons, and fresh herbs. Step 5: Roast the turkey at 450 degrees for 30 minutes and then reduce the heat to 350 degrees. Continue cooking the bird until the internal temperature reaches 165 degrees Fahrenheit. I like to use a instant read thermometer to monitor the temperature. Check the temperature at the thickest part of the thigh without touching the bone. Once cooked, remove the turkey from the oven and allow to rest for 30 minutes before carving.